Issey Miyake has been at the cutting edge of clothing design – or, “making things”, as he prefers to call it – for over 50 years. As a result, his innovative designs are always future-looking. Above all though, there lies beneath a foundation of traditional techniques (both Eastern and Western), along with a deep respect for the materials at use. Miyake studied haute couture in Paris in the 1960s, under the likes of Guy Laroche and Givenchy. He returned to Japan in 1970 so he could found Miyake Design Studio Inc. He presented his first collection in New York 1971, going on to debut his women’s main line in Paris in 1973. The menswear line was first shown in 1976. Primarily this was as counterpart to his women’s line. 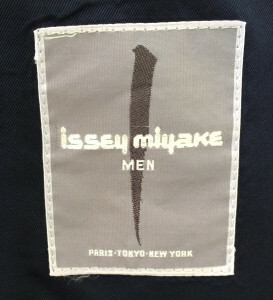 Later on it evolved into its own independent line, ISSEY MIYAKE MEN in 1978. 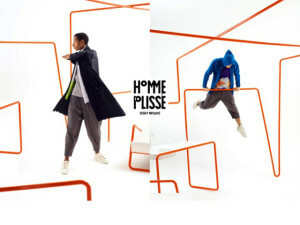 The main two menswear lines you should be looking out for are ISSEY MIYAKE men’s line and ISSEY MIYAKE MEN. For all intents and purposes they are very nearly the same line; indeed, between 1976-1985 I believe they used the same brand label. Early pieces all used these distinctive grey garment labels, so they are easily identified. The menswear line had its first independent show in 1978. When comparing the two men’s lines, the mainline was perhaps the slightly more luxurious, and avant garde. 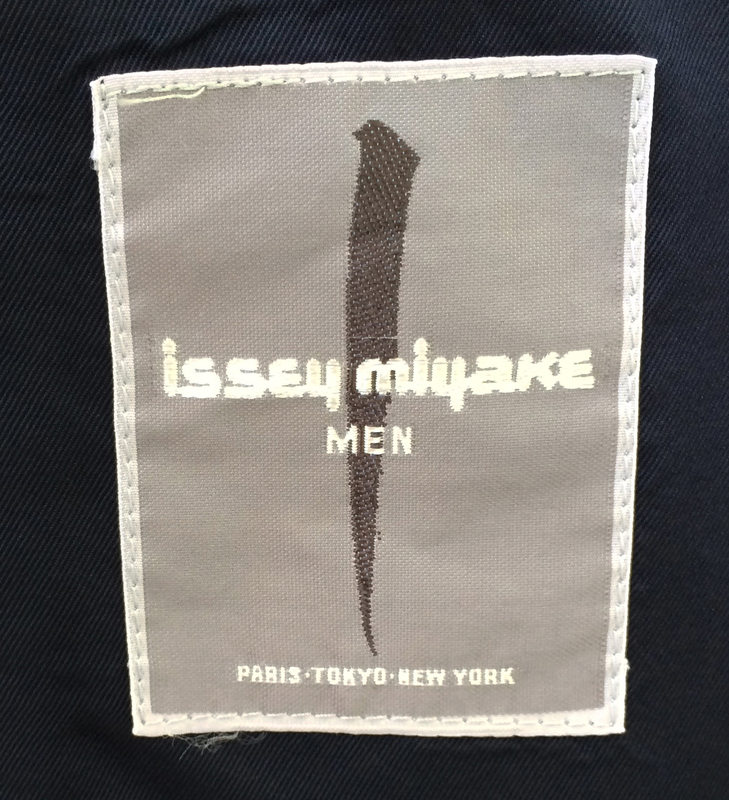 You can spot the ISSEY MIYAKE men’s line pieces as they usually used a black-backed label, with white typeface, whilst the women’s line usually (but not always) used the reverse. ISSEY MIYAKE MEN certainly isn’t inferior to the main line. It’s very much a brand in its own right. Fortunately it’s easy to identify ISSEY MIYAKE MEN pieces. 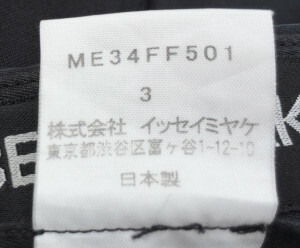 There’s one more strand of the main lines we need to talk about: ISSEY MIYAKE WHITE LABEL, which makes both women’s and men’s clothes. Don’t be fooled by the name, ISSEY MIYAKE WHITE LABEL menswear items have black labels (confusing right!) and only the women’s have white labels – just the same as with the main line labels. In 2012, presumably in an effort to make things a bit more clear, all the menswear lines were amalgamated under the ISSEY MIYAKE MEN brand. Phew! 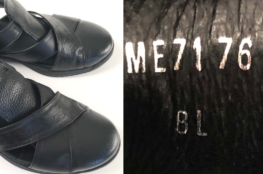 In order to check whether a vintage ISSEY MIYAKE or ISSEY MIYAKE WHITE LABEL garment is a men’s or women’s piece, you need to inspect the product code on the care label. Men’s garments always start with ME. 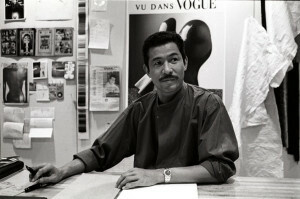 Issey Miyake’s vision of creating clothing from a single thread gave birth to A.POC (A Piece of Cloth). The line was developed in conjunction with engineering designer Dai Fujiwara. The concept was brought to life via the extensive use of computer technology. This label has now evolved into the ready to wear line A.POC Inside. Usually you’ll find both the ISSEY MIYAKE label, as well as an A.POC label on these garments. 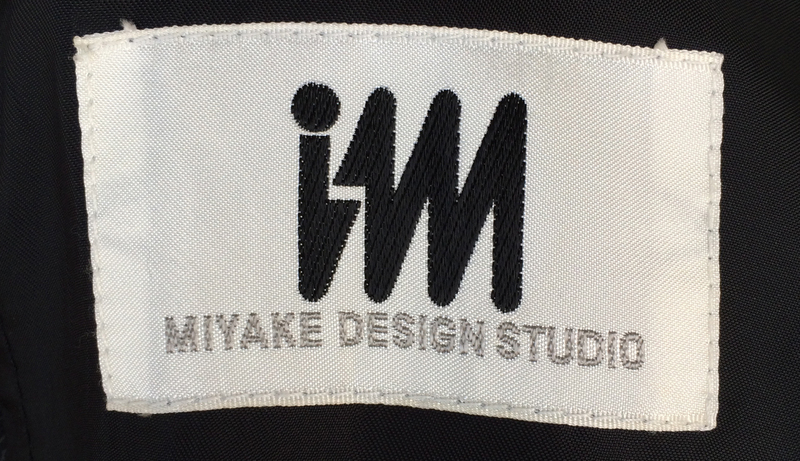 Alongside the mainlines we’ve looked at, there is also IM MIYAKE DESIGN STUDIO. 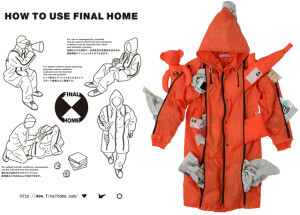 The parent company, Miyake Design Studio Inc. overseas this line. the parent company. These items are produced for a wider market. Nevertheless, there are still some great pieces out there to be found. 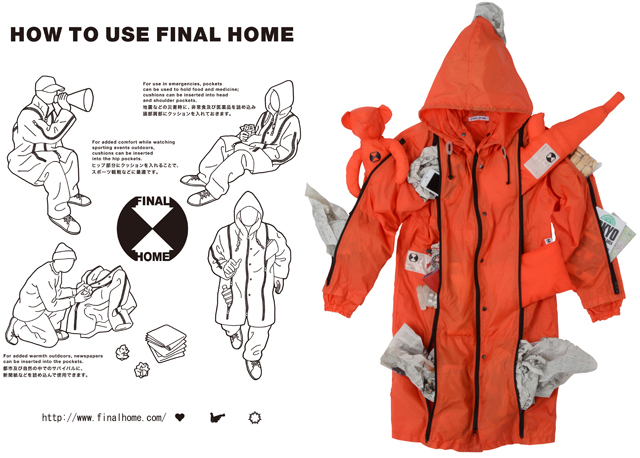 FINAL HOME, is not strictly a Miyake Design Inc. line. This is because it was created by one of their designers, Kosuke Tsumara, and distributed by Issey Miyake from 1994 onwards. The line’s core product was a nylon jacket that was able to transform, thanks to a series of zipped compartments and padded cushions. Issey Miyake launched the new, innovative brand 132 5, in 2010. It makes futuristic clothing for both men and women. The production method employed utilizes old plastic bottles, along with other recycled fibers. Furthermore, these clothes are designed using computer algorithms, incorporating helix shapes. These were originally developed by scientists for solar panels. 132 5. 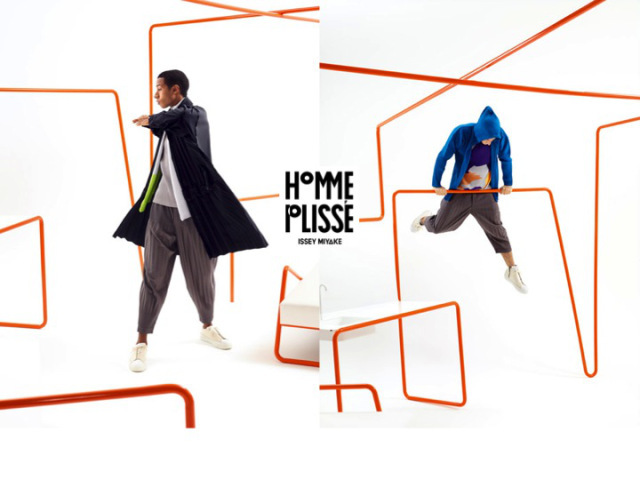 ISSEY MIYAKE © Miyake Design Inc.
Miyake Design Inc. launched HOMME PLISSÉ ISSEY MIYAKE in 2013. This was in response to the fact that sales to men accounted for 10% of Pleats Please sales. This line offers many wonderful pieces, showcasing Miyake’s trademarked pleating techniques. It’s one of the most popular lines today. 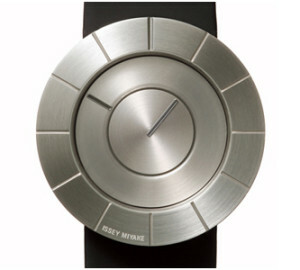 HOMME PLISSÉ ISSEY MIYAKE © Miyake Design Inc.
ISSEY MIYAKE WATCH produce some truly unique timepieces. It started in 2001 as a collaboration with Shunji Yamanaka. It’s grown to form a permanent collection of 13 different styles, by a host of designers. They all share Miyake’s futuristic perspective on design. Tokujin Yoshioka’s “TO” Watch © Miyake Design Inc.
ISSEY MIYAKE PARFUMS is possibly the sector where Issey Miyake is now most widely known. 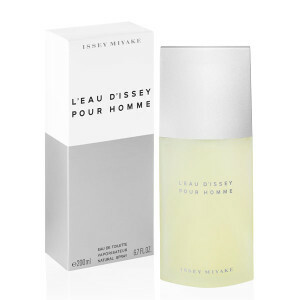 L’EAU D’ISSEY POUR HOMME is one of my all-time favourites colognes. Citrus notes, with a little spice for good measure. L’EAU D’ISSEY POUR HOMME © Miyake Design Inc.
IN-EI ISSEY MIYAKE is a lighting product brand which grew out of the technology developed for the 132 5. clothing line. Through his now familiar exploration of geometry, Miyake combines futuristic production methods with the traditional Japanese concept of light and shadow. 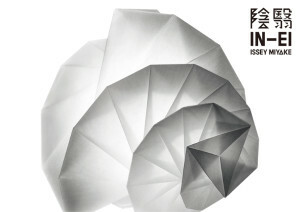 IN-EI ISSEY MIYAKE © Miyake Design Inc.
Issey Miyake stepped back from Miyake Inc. in 1997. However, he has maintained an influential position within the company. Nothing gets through to market without his approval. 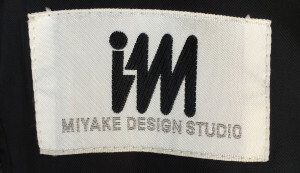 At the present time, most of Miyake’s creative work is based around his role as one of the co-directors of Japan’s first design museum, 21_21 Design Sight.